As 2011 draws to a close, KfC is going to indulge in some blogging selfishness with this review. Regular visitors here will know that I am a fan of the newspaper/journalist novel, since that was my wage-earning trade. On a completely different front, reading Clark Blaise’s exceptional story collection, The Meagre Tarmac, earlier this year reminded me how much I have enjoyed the Montreal-based writers of the 1950s and 60s in my reading career. Mordecai Richler is a favorite on this blog (my reviews of Duddy Kravitz and Barney’s Version rank first and sixth respectively on the all-time hits list as this blog approaches its third anniversary). Back in the 1970s, when I had a weekly book column in the Calgary Herald, my favorite author was Hugh Hood — I’ll be revisiting some of his works in 2012. Mavis Gallant, Brian Moore and John Metcalf were all part of that Montreal gang as well; Canadian book publishing was in its infancy, but Montreal had a group of authorial stars that ranked with London and New York. All of which made chasing down a copy of William Weintraub’s Why Rock The Boat a worthwhile objective. I did not realize until the physical book arrived that 2011 marks the half-centenary of its first publication in 1961. The book is long out of print (allthough Kobo, Sony and Kindle all have an e-version for only $3.99) but a little bit of chasing around the web will produce some reasonably-priced used print copies (and some outrageously-priced ones as well). 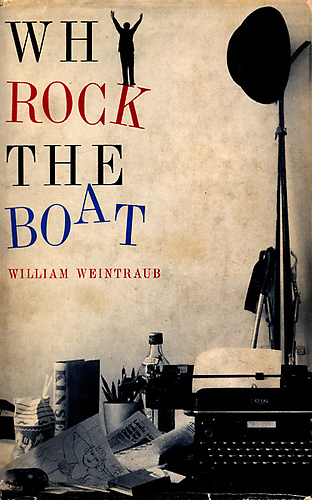 Weintraub hung out with the group cited above, was a reporter at the Montreal Gazette and Weekend Magazine before getting into book writing and KfC’s memory said Why Rock The Boat was one of the funniest “journo” books that I had ever read. My first reading came before I started my own journalism career in 1968 — would the novel hold up in a reread almost 50 years later? Yes, it does — although it has to be admitted that the journalistic set pieces (which are what I remember) fare quite a bit better than the central “love story” line. Actually, a fairer assessment would be that the love story line is there only to create an opportunity for the set pieces, so we’ll concentrate on them here. Harry Barnes is a 19-year-old cub reporter at the Montreal Daily Witness and we meet him on the chilly steps of a Gothic Montreal church, taking down the names of those who are attending the funeral of a local worthy to be published as an addendum to the story on the funeral itself — yes, we were still doing that when I started in the business, since lists of names assured readership not only from those named, but many of their relatives and friends. It’s no use, you can’t write with gloves on. Putting the notebook and pencil into his mouth, Harry Barnes pulled off the gloves and once again the snowstorm bit into his hands like a salted cat-o’-nine tails. Shuddering, he stuffed the gloves into his overcoat pocket and waited for the two men coming up the steps. “Your names, please?” he asked. “H.R. Tapscott,” said one of the men. “Gordon Enright,” said the other. It was dangerous, it was cold — but it was exciting. To be only nineteen years old and to actually speak to the great H.R. Tapscott! And who would be next? Eagerly he peered down to the curb, where the big limousines were debouching their passengers and vanishing down the windy whiteness of the street. Harry figures he will be on the funeral beat long enough that cutting the finger tips out of his gloves so he can keep them on as his compiles his names is a good idea. Already, however, he has promotion in mind — perhaps he can graduate to the “hotel” beat where you tour the hotels to interview prominent guests who are visiting the city (yes, the young KfC did that as well in his early newspaper career). That is, if he doesn’t get laid off first — the Witness is in serious financial trouble and “there was talk of a drastic staff reduction coming up, a bloodbath of an economy wave. Heads were going to roll and right now they were selecting the heads.” That, too, is a very contemporary sentiment — there is not a newsroom in the English-speaking world right now where the Internet, social media and shrinking paid readership are not producing entirely legitimate fears that yet more layoffs (and there have already been many) are inevitable. The heavy emphasis on service club meetings was in keeping with the principle that what people are most interested in reading about is what they already know. Thus each service club member would want to read the account of the speech he had heard the day before, even though no one else in his right mind would. In this way circulation was built, slowly and laboriously — sixty Bellringers, ninety charity donors, thirty Auxiliary ladies. It all mounted up. The other Montreal papers occasionally ran stories that were quite absorbing, but the Witness was beyond that. And Witnessmen were proud of the massive boredom their paper was able to achieve; there was a certain grandeur about it that only professionals could fully appreciate. The exact form might be anachronistic today, but that business strategy has evolved into a modern version. The next time you visit a newspaper website, check out the comments on one of the “lifestyle” stories (or the host of picture “galleries” for reader-submitted photos) — do you really think anybody looks at these, except for the people who submit them for their own brief moment of “fame”? Why Rock The Boat has a host of set pieces like this (a hotel fire at a nudist convention, the annual journo ski weekend/drunk in the Laurentians, phoney “practice” stories featuring the managing editor in embarrassing circumstances that find their way into print) but I’ll offer just one more. One of Harry’s practice stories (the “corned, loaded and pissed” managing editor has been sentenced for drunk and disorderly conduct) has found its way into the paper. Harry has not been caught — Fred Sullivan, recently demoted to the Religion beat after twenty years on Police, has been deemed the culprit and given his Rockefeller, the Witness newsroom label for severance cheque. Old Sullivan, Harry realized, would by lying in state at Krasco’s. Lying in state was the term used to describe the traditional three- or four-day drinking marathon staged by Witnessmen to celebrate being fired. It lasted until the Rockefeller was spent and, while it was on, fellow journalists would drop by to commiserate with the bereaved, to suggest new employment possibilities, and to discuss the character of Philip L. Butcher [the managing editor who takes great pleasure in determining the victim/Rockefeller recipients]. Like most civilized mourning customs, lying in state assuaged grief in a sensible way. I’ve managed to complete this review without reference to the plot thread that supplies its central theme — a young woman reporter from a rival paper walks into that all-male Bellringer lunch and young Harry falls instantly into infatuation. Okay, it is a very, very slender theme, but, hey, you need some interior structure to create the opportunity for the set pieces. The newspaper business has certainly mutated over the last 50 years, but if there is one overwhelming impression that this re-read left it is how little has really changed. The nature of the rituals may have evolved, but there are more similarities than differences in what exists today. And I laughed just as hard this time around as I did when I first read Why Rock The Boat before beginning my own newspaper career, a 27-year journey that involved almost every aspect of the editorial side of the business. If you have any fondness at all for newspaper novels, Why Rock The Boat is worth tracking down.